Planning a camping trip this summer? Our country has a vast diversity of options, but these 25 campsites across the country are some of our favourites. Where will you pitch a tent this season? Let us know in the comments below! PS. 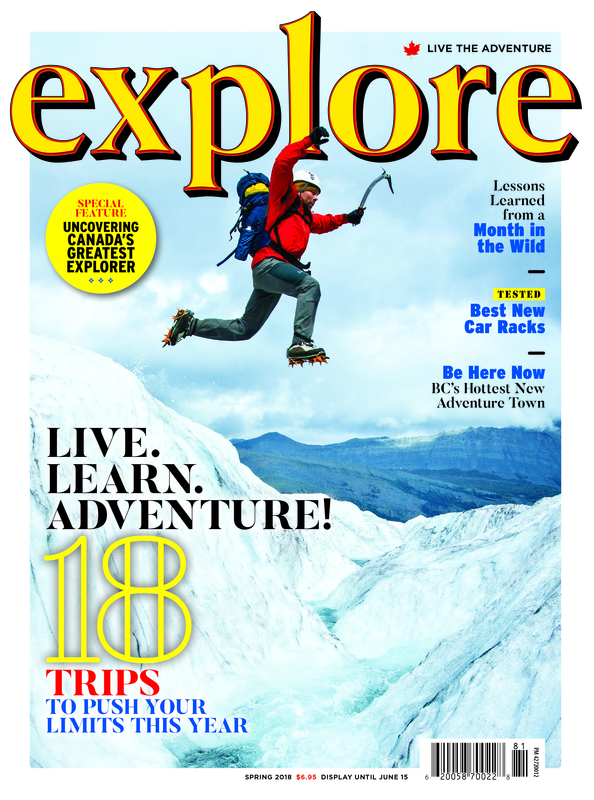 Did you know we started a private club for readers of explore magazine? 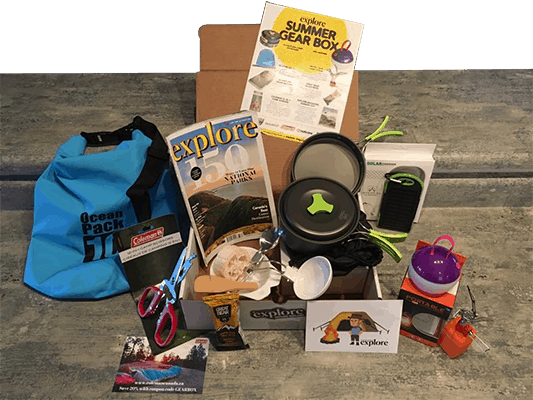 Explore's "Live the Adventure" Club is a subscription box plus an exclusive Facebook community full of like-minded adventurers and outdoors experts. We'll send you a carefully curated box of adventure gear every 90 days, plus invite you to compete in outdoors challenges for the chance to win sweet prizes! The main draw: Long Beach is the ultimate Pacific experience—22 kilometres of sand with a horizon that disappears into the ocean. Green Point marks the lone campground along its length. The campsites here sit on a ledge above the beach, close enough to the ocean that the sound of surf lulls campers to sleep. A short path descends to the sand. Most of the 113 sites are drive-in but there are 18 walk-in spots that are somewhat secluded. Things to do: Start by exploring the beach. Walk or run in either direction and scan the flotsam for beach booty. Of course, you can also go for a swim, but be aware that the water is about 10°C. 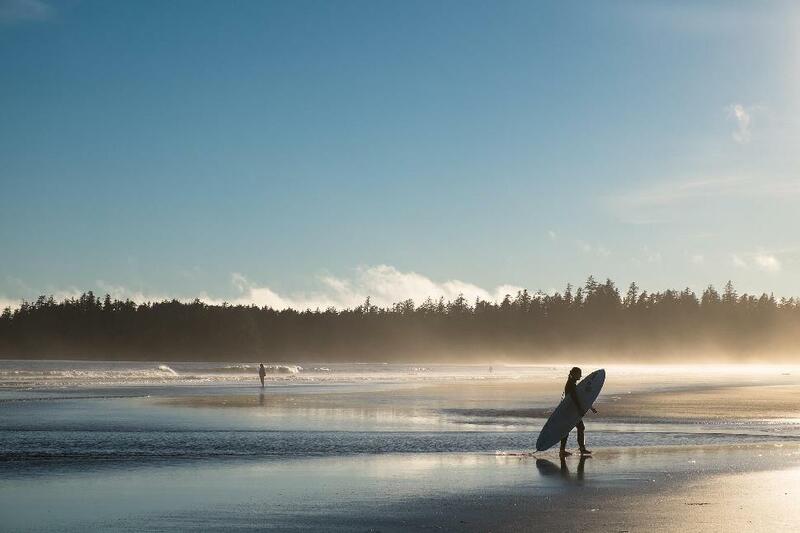 If you’re into surfing, there are almost always waves at Long Beach, but if you’re looking for more serious action, or lessons, you can head 20 minutes north to the town of Tofino. Grey whales spend the summer in the waters just offshore, and one of the best places to see them is at the Amphitrite Lighthouse in the town of Uclulelet, about 20 minutes south of the campground. Nugget: You can turn a one-way stroll along the beach into a loop by catching the Tofino Bus (tofinobus.com) back to the campground. The main draw: What this small park lacks in size it makes up for in location, sitting just north of Squamish—“Canada’s Outdoor Recreation Capital.” Campground paths link into the area’s world-class mountain-biking network. Nearby hiking is steep but spectacular with mountain-to-ocean views. And of course there’s the rock climbing that put Squamish on the map. When you get tired—and you will—hop in Alice Lake for a refreshing dip and then relax on the sandy beach. Things to do: A good warm-up to Squamish mountain biking is Wonderland, a three-kilometre roller-coaster ride starting just outside the campground. Link it with Brackendale trails and Cheshire Cat and White Rabbit for an intermediate loop. Forgo hiking in the park itself for better trails a short drive away: the hike to the three summits of the Stawamus Chief, the trek to the alpine meadows on the way to Elfin Shelter, and the stiff but rewarding climb to Garibaldi Lake in Garibaldi Provincial Park. Get a feel for the local granite at the one-pitch-rich Smoke Bluffs climbing area before getting high on a Squamish multi-pitch classic, such as Snake or Diedre. Nugget: Don’t miss Squamish’s Howe Sound Brewing (howesound.com), where you can sample seven local ales with a woodfire pizza. The main draw: It takes a day of hiking to get to this campground at the centre of Cathedral Provincial Park, in the Cascade Mountains west of B.C.’s Okanagan, but the park’s interior is worth it: a subalpine plateau of fish-filled lakes, unique geology, alpine meadows and, most importantly, plenty of hikeable summits and ridges. Day hikes project like spokes on a wheel from the campground, which sits on a turquoise lake across from impressive granite walls. Things to do: The best hike is the Cathedral Rim Trail, a highline loop along a series of ridges topping out at over 2,500 metres. The route passes some of the park’s best-known geologic formations, including Smokey the Bear, the Devil’s Woodpile and Stone City. The Lake-view Mountain Trail leads to the park’s high point and provides extensive views—on a clear day you can see Mount Rainier’s bulk, 300 kilometres away. Four of the park’s lakes were stocked with trout in the 1930s. Cast for trophy rainbows in Ladyslipper and cutthroats in Lake of the Woods. Nugget: If you don’t feel like hiking in, you can arrange to hitch a ride to the centre of the park on a shuttle operated by Cathedral Lake Lodge (cathedrallakes.ca). 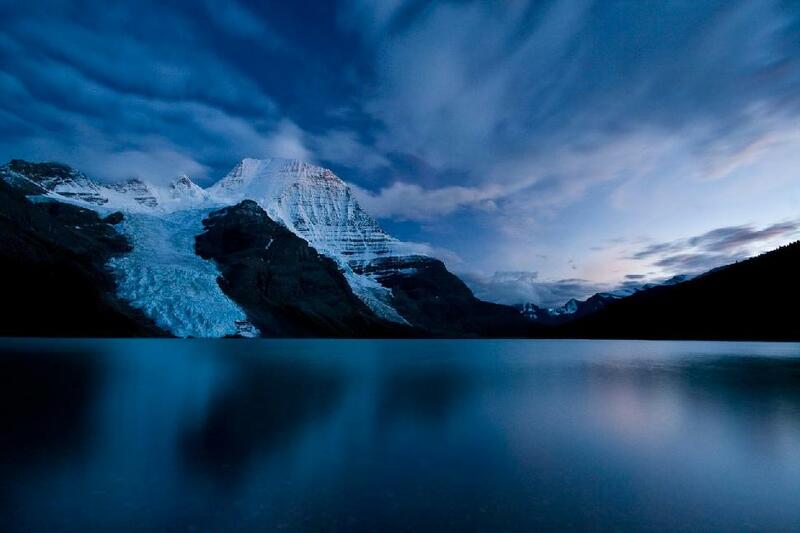 The main draw: When you first see 3,954-metre Mount Robson from the highway about 25 kilometres away, it’s obvious that the highest mountain in the Canadian Rockies is also one of the most spectacular, with its immense bulk rising nearly 3,000 metres above you. And there’s no better place to admire its grandeur than at the Berg Lake Campground, which sits at the northern base of the peak, about a day’s hike from the highway. As its name suggests, the campground is located beside a small lake that actually contains mini icebergs that have broken off from a glacier on the mountain above. Things to do: The Berg Lake area has several world-class hikes. If you need a recovery day after the 20-kilometre trek in, hike the Mumm Basin route for an eye-popping overview of Robson’s glaciated flanks for relatively little effort. The Snowbird Pass hike is an ambitious 22-kilometre round trip that runs along moraines, through alpine meadows and past the stunning Robson Glacier. The pass itself peers down on the vast Reef Icefield, which looks as if it was transported from Antarctica. Nugget: Save time on the hike in and out by taking a mountain bike, which is allowed on the first seven kilometres of the Berg Lake Trail. 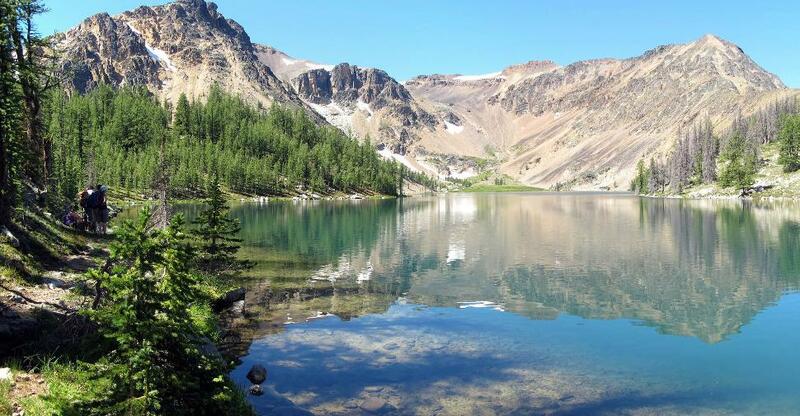 Things to do: Besides fishing for rainbow or cutthroat trout from camp, you can shoulder your rod and trek to Maude or Three Isle lakes for backcountry angling in spectacular locations. If you don’t fish, continue on to the flower-filled meadows and nice mountain views at South Kananaskis Pass. More ambitious hikers can tackle the all-day expedition to the headwall at Fossil Falls on an informal but well-used trail. Around camp, launch canoes and kayaks to explore the shoreline of Upper Kananaskis Lake. 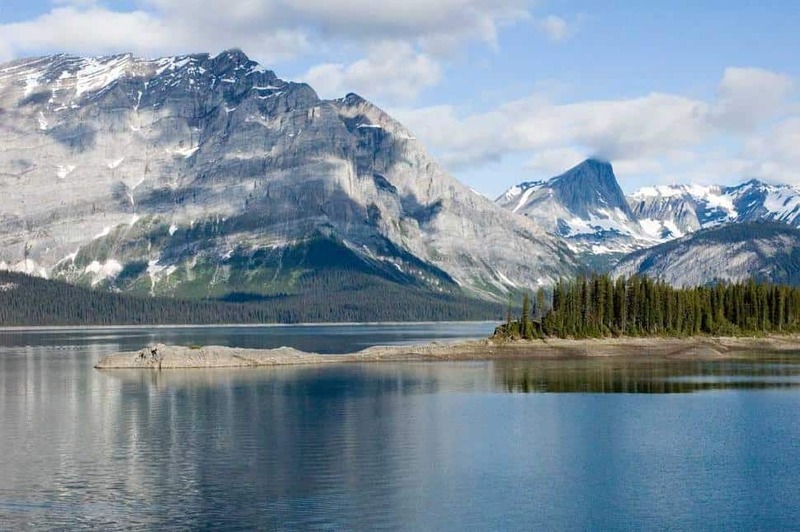 Nugget: For a quick and easy taste of alpine, drive south to the 2,200-metre Highwood Pass on Highway 40—Canada’s highest paved road—and hike the five-kilometre Ptarmigan Cirque Trail. The main draw: You might wonder why a campground in the middle of a village—on a vast grassy field mowed by fearless mule deer into putting-green perfection—qualifies for this list. 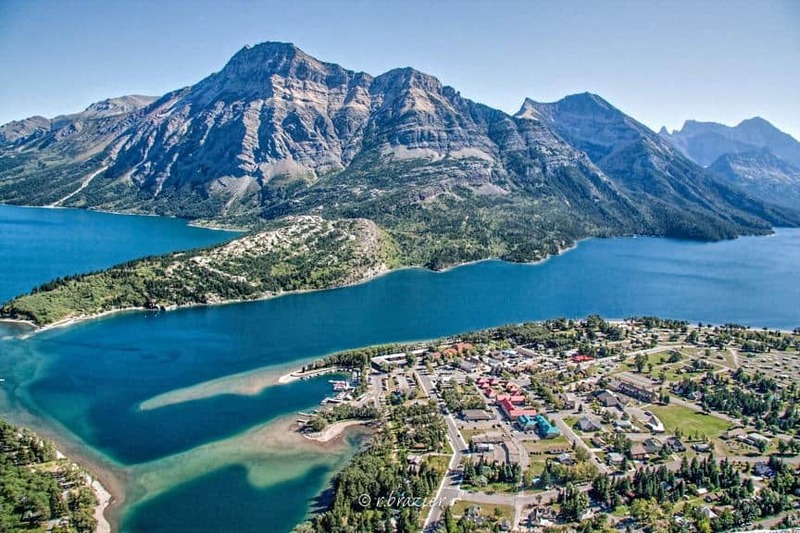 The reason is that Waterton Lakes is by far the smallest of our Rocky Mountain national parks, so that even when you’re camping in town, you’re still within easy striking range of the park’s day hikes and other activities. Plus, you’re just down the road from restaurants and stores. Things to do: The jewel of Waterton is the one-way, 18-kilometre Carthew-Alderson Trail. Take one of the morning shuttle buses to the trailhead at Cameron Lake. The trail meanders uphill for the first eight kilometres to Carthew Ridge, with its imperial views, and then descends all the way back to town. Another excellent choice is the 17-kilometre (return) Crypt Lake Trail, which begins with a boat ride to the east side of Upper Waterton Lake and then climbs past waterfalls, through a tunnel and along cliff faces until you reach the trail’s namesake lake. While in town, check out the stately Prince of Wales Hotel, dramatically positioned on a high bench overlooking the Waterton Lakes. Nugget: When driving south from Calgary, stop at the town of Longview to buy some homemade jerky. 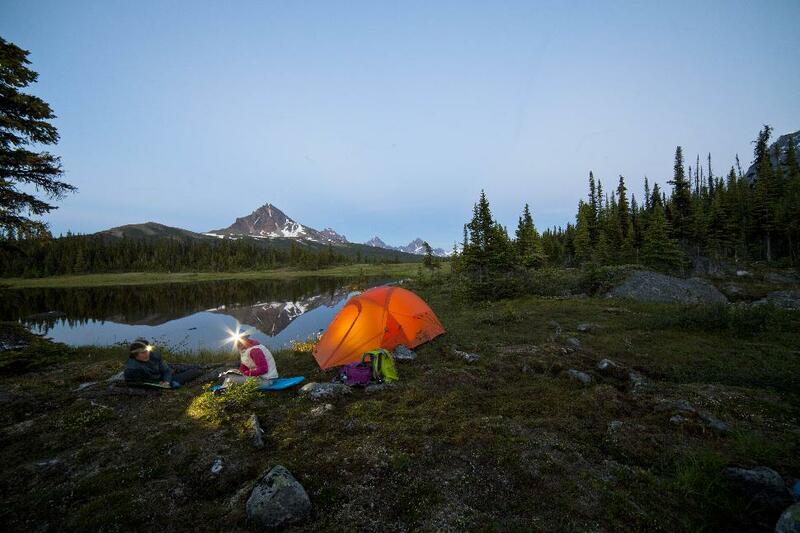 The main draw: Sitting just off the Icefields Parkway at an elevation of more than 2,000 metres, this tent-only spot is among the highest places in Canada to go car camping. 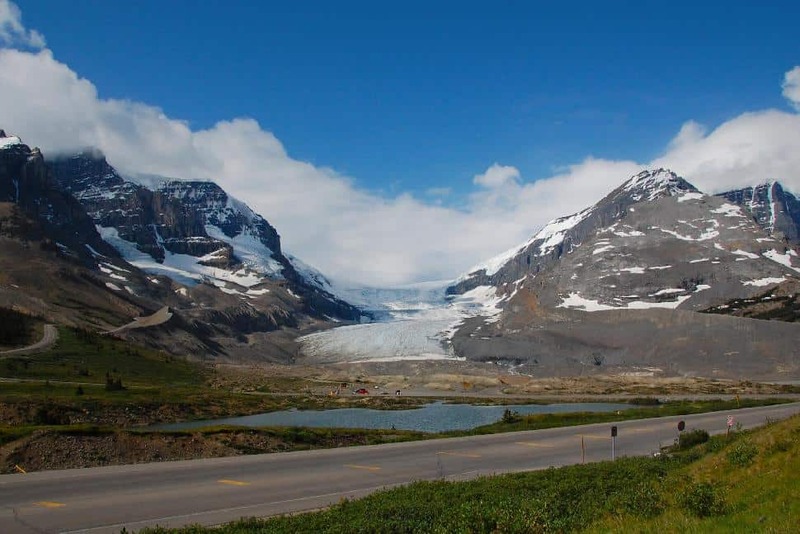 But the real reason to come here is that it sits across the road from one of the country’s most famous scenes: the fractured tongue of the Athabasca Glacier rolling down from the Columbia Icefield, surrounded by snowy 11,000-foot summits. The campground also provides easy access to world-class hikes and the glacier itself. Things to do: Head out the back of the campground and onto the Wilcox Pass Trail, one of the top hikes in the Rockies. The trail climbs quickly to a wide, treeless pass, and the views of the icefield and its neighbouring peaks improve with every stride, as do your chances of spotting the resident bighorn sheep. 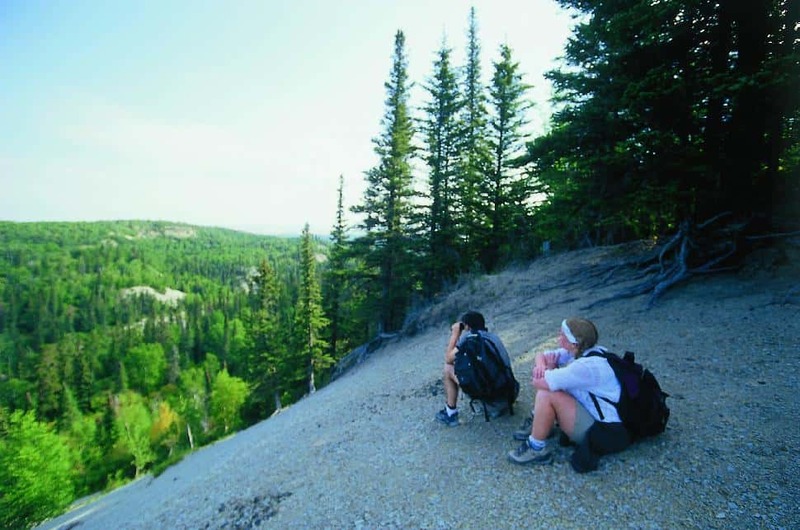 There are also other excellent hikes nearby—Nigel Pass, Saskatchewan Glacier and Parker Ridge. If you’re a mountaineer, both mounts Athabasca and Andromeda are classic climbs. If you’re not, but would like to explore this icy landscape, sign up for a guided glacier walk (icewalks.com). Nugget: You can grab a beer and a lunch buffet, with a side of killer view, at the Icefield Centre, just up the road. The main draw: The abundant rock drawings here testify to the area’s historic importance for the Blackfoot people, but even most non-Native visitors to this small park in the southeastern corner of Alberta feel a spiritual connection to its desert-like environment. The landscape features sandstone cliffs, badlands, hoodoos and the kind of wildlife you just don’t see much in Canada. You can explore on both guided or self-guided hikes, and when the desert heat cranks up, the nicely shaded campsites sit close to a sandy beach on the Milk River. Things to do: Led by a Blackfoot interpreter, the must-do Rock Art Tour visits a restricted area of the park that is home to many petroglyphs and pictographs. And make sure to check out the Hoodoo Hike, a short walk along the river past precarious sand towers and rock art galleries. 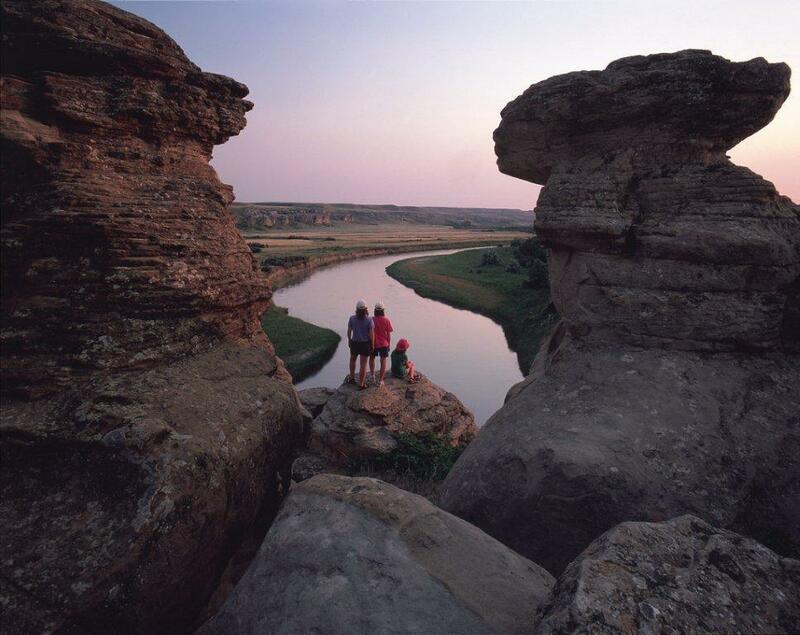 You can also wade across the river and hike off trail to Davis Coulee, wandering through the sagebrush, grasslands, badlands and hoodoos. Nugget: The Milk River runs fairly low in summer, but in spring it’s a fun whitewater paddle. The main draw: Grasslands is one of the few places where the Canadian prairie resembles its original form. Fencelines and wheat fields are nowhere to be seen, and plains bison and black-footed ferrets roam across wild short-grass hills and valleys. 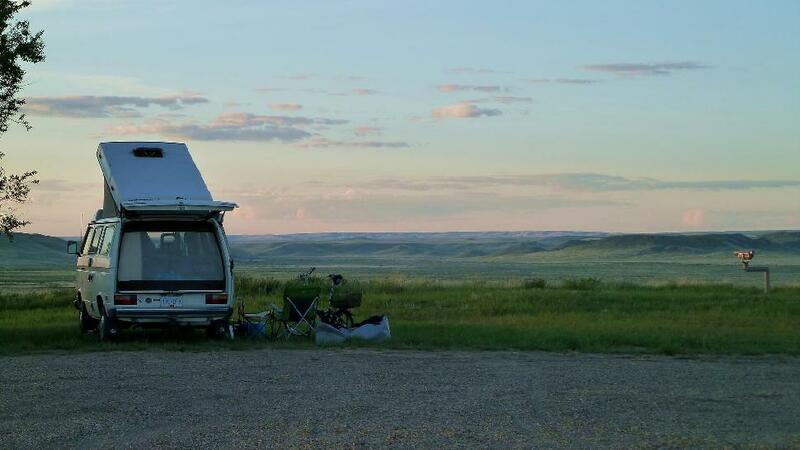 While you can camp just about anywhere here, this car-accessible location in the Frenchman River Valley—in the West Block of the two-piece park—offers cover from the wind and looks out on the grasslands. The fully developed camping area is located close to the established trails and within hiking distance of the bison’s preferred hangouts. Things to do: Random hiking and riding is encouraged in Grasslands. Head cross-country up the Timbergulch route into the rarely visited northeast corner of the West Block for a good chance of spotting pronghorn antelope and bison. In the East Block, walk an old homestead road from McGowan’s south to Zahursky’s to take in the badlands scenery. The brand new Eagle Butte Trail leads to an impressive viewpoint. Mountain bikers can pedal the Broken Hills Trail to a panoramic viewpoint of the park. Nugget: If you’d like to free your inner cowboy, you can hit the range on horseback (ridewithlamotte.webs.com). 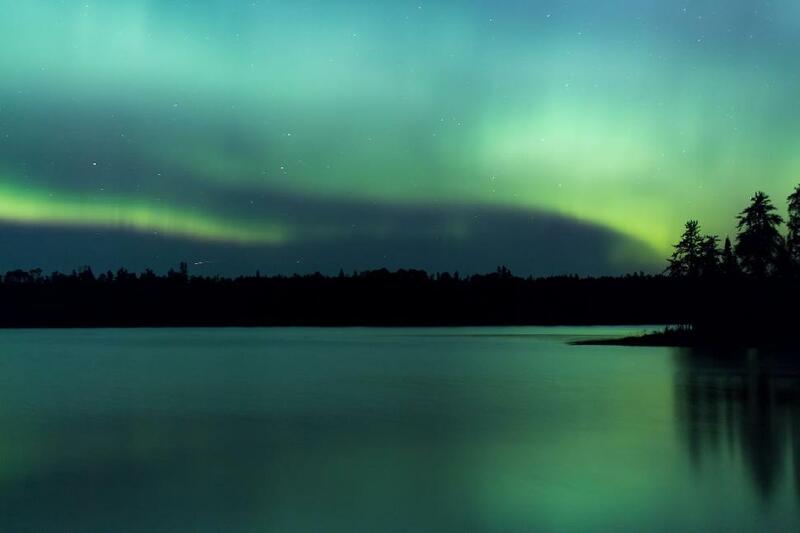 The main draw: Quiet Nopiming Provincial Park possesses all the qualities of its southern neighbour, the Whiteshell, except for one—it doesn’t have too many visitors. The park’s lakes and rivers combine into excellent canoe routes through the Canadian Shield on the Manitoba-Ontario border. A woodland caribou herd wanders its northern reaches and moose and wolves are commonly seen. With only 36 sites, Tulabi is not only the closest campground in the park to Winnipeg but also the most private, with its own beach right on the Bird River canoe route. Things to do: Launch your canoe at the campground and spend a day paddling up the Bird River to Elbow Lake via a series of portages. The next day, head in the other direction and fish for walleye, pike and bass in Bird Lake’s many bays. The Walking on Ancient Mountains Trail may be a bit of a drive, but this short hike provides an excellent view from the top of a rocky outcrop. You’ll also see evidence of the peaks that once towered above, and witness how the forest is returning after a major fire 30 years ago. Or just hang your camping hammock among the spruce trees and stargaze late into the night. Nugget: Break up the drive to the Ancient Mountains trail and learn about the park’s mining history at the abandoned Irgon Mine site. The main draw: A forested highland jutting out of the Manitoba prairie, Riding Mountain stands in stark contrast to the surrounding farmland. Famed Canadian conservationist Grey Owl, who came here in 1931 (with his celebrity beavers Jelly Roll and Rawhide) to be the “keeper of native animals,” described the park as “a land of coyotes, elk, jumping deer, and some darned good view[s].” There’s no better place to stay than the Whirlpool Campground—it’s only 15 minutes from the full-service town of Wasagaming, yet the tent-only, walk-in sites sit on a quiet lake, the campground is rarely busy, and some of the best trails in the park start only a short drive away. Things to do: History buffs may want to do the full-day hike from the campground through the forest to Grey Owl’s cabin. A more scenic hike climbs up Gorge Creek on the escarpment’s eastern edge to an open ridge overlooking the neighbouring flatlands. Nearby, a network of mountain-bike trails runs off the North Escarpment Trail, perfect for an afternoon adrenalin and aerobic fix. For something different, head into the grasslands along the South Escarpment Trail. Nugget: While it’s possible to see elk, moose and black bears in the park, plains bison are guaranteed—just drive through their enclosure near Lake Audy. 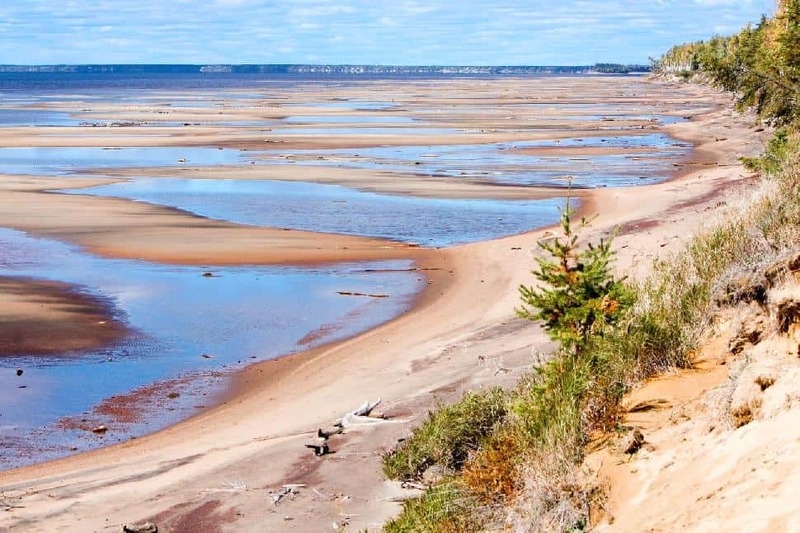 The main draw: Drive down the rough 14-kilometre Gargantua Road from the Trans-Canada Highway and you not only end up at the shore of Lake Superior, but also at some of the best shoreline scenery in the country. There are no campsites right where the road stops, but you’re only a half-hour hike (or paddle) from a series of lake-side campsites. Head north along the Coastal Trail and you’ll find three spots on a nice sandy beach; head south and you’ll find three more on a quiet cobble beach. Once you’re settled, there’s enough to do here to keep busy for days. And the west-facing campsites ensure deadly sunsets. Things to do: Gargantua Bay is perfect for sea kayaking, with numerous islands offering day-trip destinations and protection from the open lake. Check out Tugboat Channel, the colourful cliffs at Devil’s Warehouse and the huge beach at Warp Bay. Hikers should spend one day heading south on the Coastal Trail past a series of lookouts above the lake and another trekking three hours north to the Devil’s Chair, a funky offshore rock. Gargantua Harbour in 1906 and remains just below the surface. The main draw: Even if they’ve never been, most Canadians will recognize Killarney as the muse of the Group of Seven: the white quartzite hills, the gnarled jack pines and the incredibly clear blue lakes. “The Roof of Ontario”—located five hours north of Toronto—is famous for its excellent canoeing, but it also has plenty of scenic hikes and good sea kayaking. The best base is the George Lake campground, which sits near four lake-access points, the top trailheads and the small village of Killarney on Georgian Bay. 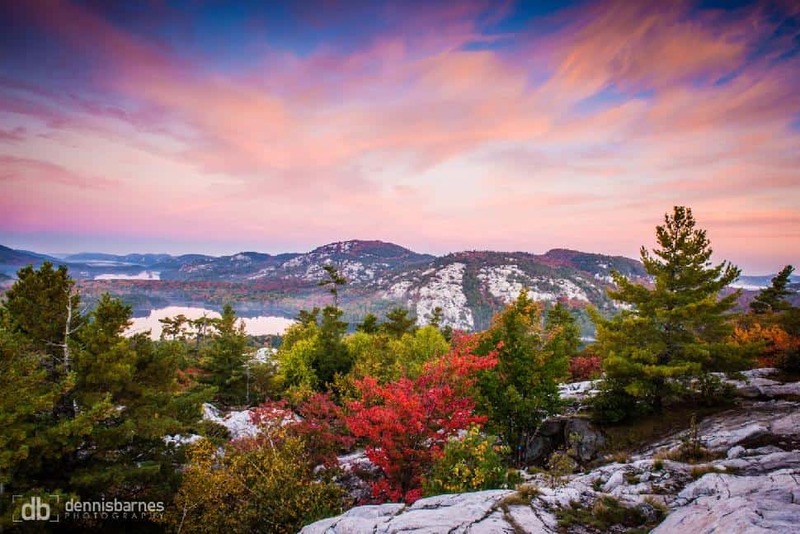 Things to do: For the best view in the park, hike the La Cloche Silhouette Trail from the campground to the Crack—a steep cleft leading to the top of a granite ridge. (You can save a few hours by driving seven kilometres east on Highway 637 to a parking lot just off the road.) For another good view, with less effort, hike up the Granite Ridge Trail. If you’d like to get a taste of the park’s paddling, outfitters will deliver a canoe to one of the access lakes. Or you can explore the convoluted shores of Georgian Bay by kayak. Nugget: Get the freshest fish and chips anywhere at Herbert Fisheries on the waterfront in the town of Killarney. The main draw: Known as the Gibraltar of Ontario, the 100-metre-high Mazinaw Rock is the star of Bon Echo, erupting from the extremely deep waters of Mazinaw Lake right across from the main campground. The 1.5-kilometre-long cliff not only adds oomph to the scenery, but its 260 pictographs make it Ontario’s richest Native canvas. Visitors to the park can play on the lake, but there’s also backcountry to be explored. And the cliff itself is a climbing mecca—there’s even an Alpine Club of Canada hut just north of the rock. Things to do: Take your own boat or the Mugwump Ferry to the base of Mazinaw Rock and hike the two-kilometre Cliff Top Trail. The views at the top stretch beyond the park boundaries. If you’d like to cover more ground, wander through the wilderness along the Abes and Essens Trail, which features three loops from four to 17 kilometres. 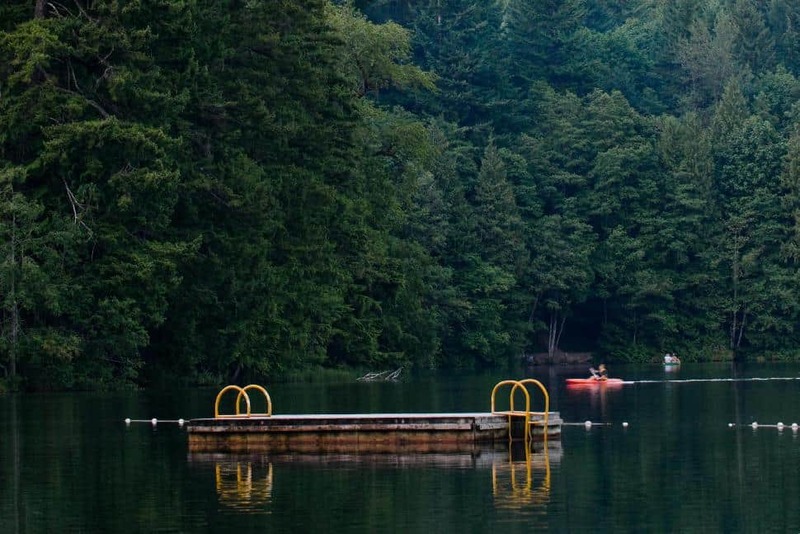 Back at the lake, you can rent a canoe and go for a paddle, or hit the beach for a swim. Nugget: This 500-site campground has five precious walk-in sites that give both privacy and a prime view of the big rock. The main draw: Sitting on the banks of a lake-calm section of the Ottawa River, an hour upstream from the river’s monster rapids and across the river from the mouth of Quebec’s famous Dumoine River, Driftwood is all about getting on the water. 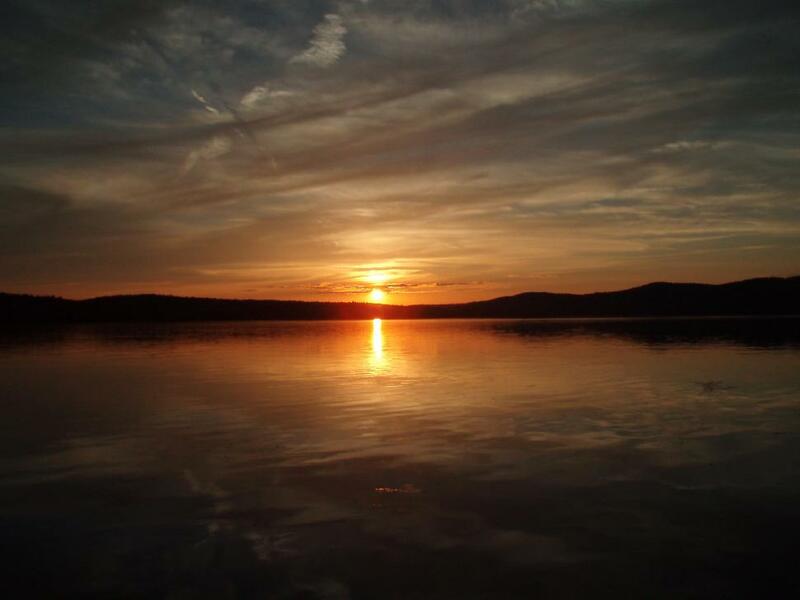 The Ottawa River campsites are sandy waterfront, perfect for swimming or launching a kayak or canoe. Plus, you can access the park’s 14 kilometres of hiking trails right from the campgrounds. Things to do: Head downriver to Pembroke and hop aboard a commercial raft for a run down the world-famous Ottawa River rapids. Whitewater kayakers and canoeists can drive over to Quebec and run a section of the Dumoine River, or paddle the Dumoine right down to the Ottawa and then back to camp. Flatwater paddlers should explore the shoreline around the park and head across the river to the mouth of the Dumoine, where it cascades into the Ottawa. This is also lake country—there are plenty of water bodies to paddle, including those in nearby Algonquin Provincial Park. Or you could give your upper body a break and hike the short Oak Highland Trail to a lookout over the Ottawa River. Nugget: On scorchers, hit the Laurentian View Dairy, about a half hour south of the park, for primo ice cream. The main draw: Ontario’s second-oldest provincial park (after Algonquin) protects the largest tract of endangered Carolinian forest in Canada on an enormous sandspit thumbing into Lake Erie, southwest of London. The park’s huge marsh, warm water, eight kilometres of beach and diverse forest attract 330 species of birds, lots of whitetail deer, and southern plants and animals such as sassafras, the Virginia opossum and soft-shell turtles. The park’s 262 camping sites also attract plenty of human visitors. Things to do: All that sand and warm water makes it pretty easy to kill a day or two on the beach. But you should also explore the unique ecosystem. Spend a day canoeing the protected marshland on the north side of the peninsula. For hiking or biking, try the eight-kilometre South Point Trail, which loops through oak savannah, along the Lake Erie shoreline and then into Carolinian forest. The Marsh Trail is another nice walk. The best birding is probably on the Spice Bush Trail, which dekes along the transition between the deciduous woods and the open marshland. Or ditch the boots and spend the day hiking the beach around the peninsula. Other Erie shoreline parks—Long Point, Point Pelee and Turkey Point—are within an hour’s drive. Nugget: While you’re in the area, check out the region’s 12-winery tour. 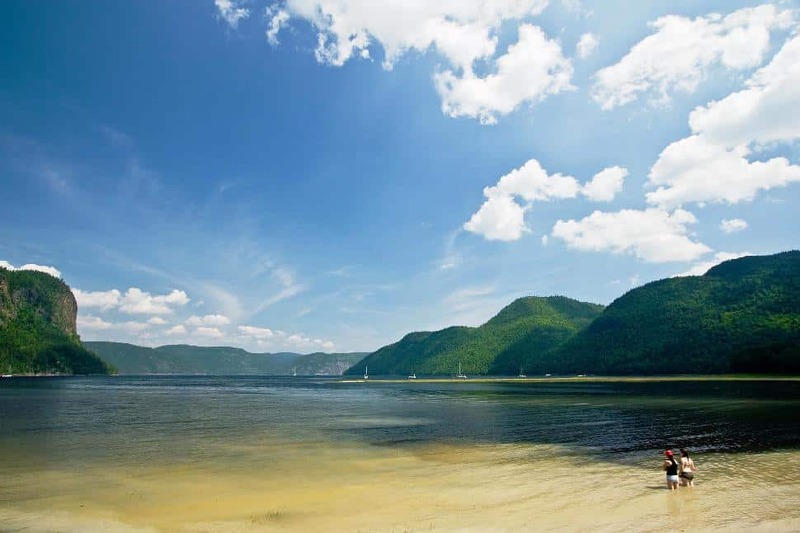 The main draw: The most scenic part of Quebec accessible by car, the Gaspé Peninsula ends near Cap- Bon-Ami in a rugged rocky finger of coves, cliffs and wildlife. 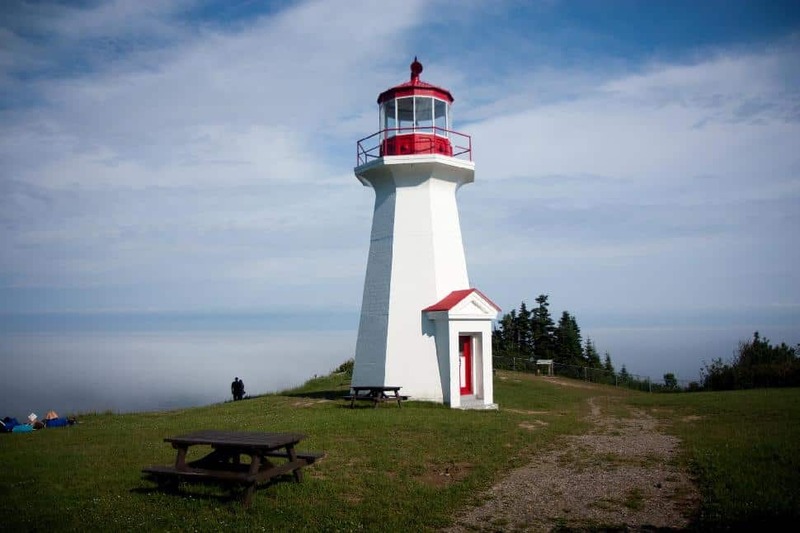 The 41 sites here are like a communal eagle’s nest looking out over Baie de Gaspé and down the abrupt coast to the tip of the Forillon Peninsula. From this base camp, your agenda could include beach hiking, kayaking, mountain biking, whale watching, saltwater fishing or even scuba diving. Things to do: For a nice oceanside hike, try Les Graves Trail, which runs to the end of the Cap-Gaspé (watch for seals and whales along the way). If you’d prefer something more vertical with a 360-degree view at the top, do the eight-kilometre grunt up Mont Saint-Alban. Both begin a few minutes from camp. You can rent your own kayak at Grande-Grave Harbour or join a guided park paddle among the kittiwakes and cormorants that nest along the cliffs of Cap-Gaspé. Under the surface, the nutrient-rich waters explode in colour and life—perfect for scuba or snorkelling (tours are available). And the park’s four beaches, including one near the campgound, make a good place to relax. Nugget: Take a whale-watching tour at Grande-Grave Harbour to see the seven species of whales swimming offshore. The main draw: The area where the Saguenay River empties into the St. Lawrence River combines the best of two worlds. 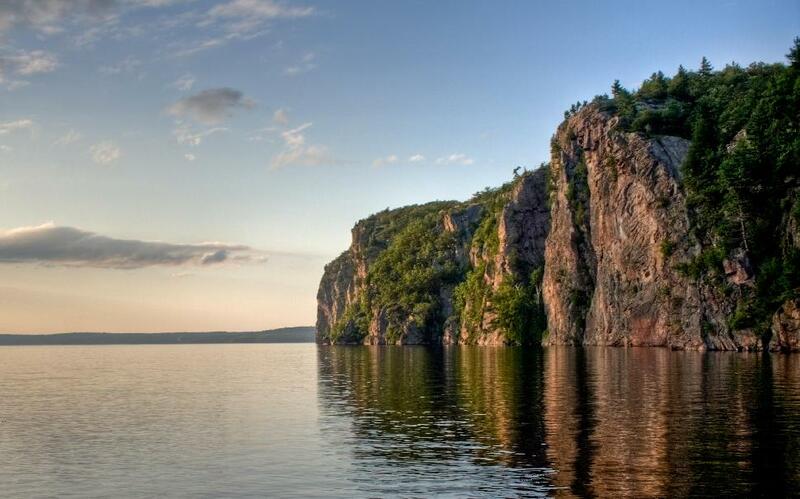 First, there’s the dramatic cliff-lined Saguenay Fjord, which is protected by the provincial park of the same name. Then there’s the unique aquatic environment at the mouth of the Saguenay, which is protected by the federal Saguenay-St. Lawrence Marine Park. Baie Sainte-Marguerite sits on the north side of the fjord, a short distance from the mouth of the Saguenay—an ideal location for exploring both parks, and for checking out the beluga whales that congregate here. Things to do: Start by hiking from the campground to the Saint-Louis viewpoint high above the fjord, keeping an eye out for the white whales in the bay below. Then rent a kayak and spot them from the water. Watch for bigger whales on Zodiac tours out of Tadoussac, at the mouth of the Saguenay. And while in the area, hike the Sentier le Fjord, which leads to a viewpoint overlooking the meeting of the two waterways. Nugget: Scope the fjord’s cliffs for peregrine falcons. At last count, 20 adults could be seen here—20 per cent of Quebec’s total. Things to do: Pointe-Taillon has 45 kilometres of bike trails, and most of those run along the shoreline. If you want a longer ride, hook up to the Véloroute des Bleuets, which runs all the way around Lac Saint-Jean. Boaters can paddle along the sandy shore or across to L’Ile Bouliane just offshore. And beachgoers should watch out for semi-precious gems such as garnets, zircons and lodestones. Nugget: If you have time, check out the waterfall and historic village at Val-Jalbert across the lake. 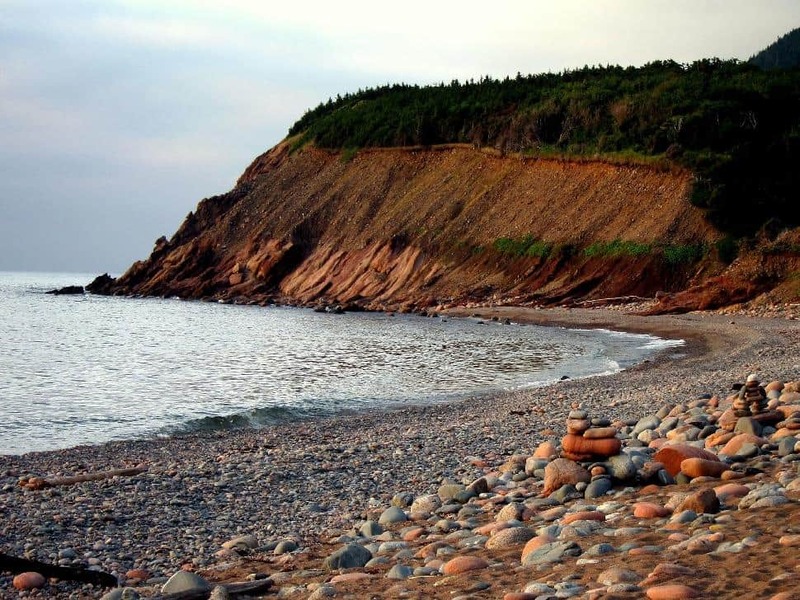 The main draw: If you’ve seen photos of the park’s world-famous Cabot Trail, you’ll know that Cape Breton Highlands features rugged high country right next to rugged ocean coastline. Nowhere is that transition from high to low more dramatic than along the park’s western coastline near the Corney Brook Campground. 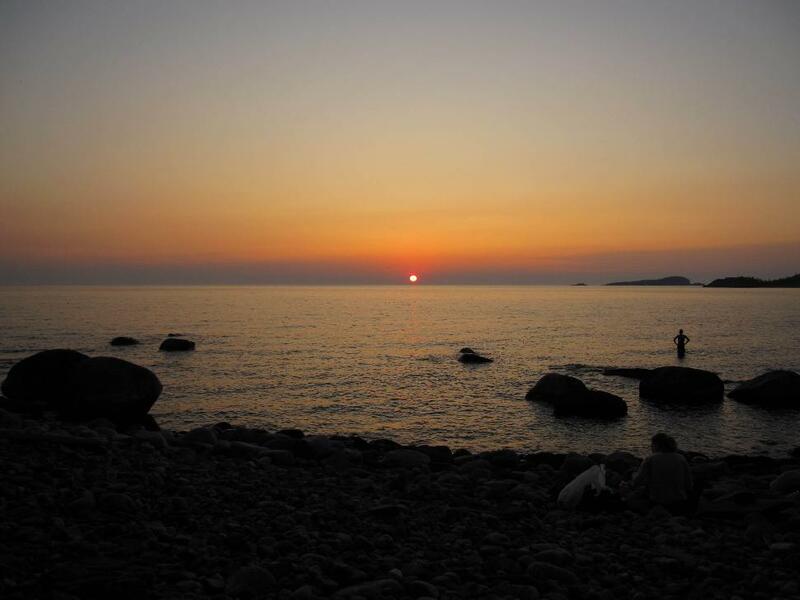 The small campground sits just off the Cabot Trail on a ledge above the ocean—well, technically the Gulf of St. Lawrence. To the east, the hills rise nearly straight up for about 400 metres. To the west, there’s a small beach and then it’s sunset-perfect water as far as you can see. Things to do: The Corney Brook Trail starts right across the road and takes you up through moose-filled forest to a nice waterfall. But if you’re looking for the ultimate view—possibly including whales—drive a short way to the Skyline Trail. The uphill drive takes care of the elevation gain, so it’s a flat walk to the spectacular lookout at the end. If you’d prefer to earn your view, the L’Acadien Trail climbs to another scenic high point. And the nearby Trous de Saumons Trail is good for running or mountain biking. 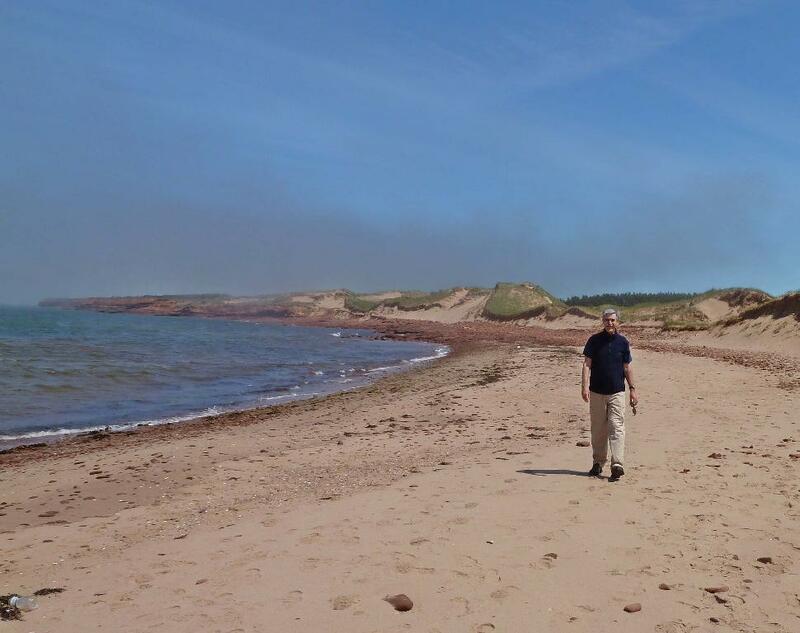 Nugget: The best beach in the area is at Cabot Landing Provincial Park, where Mr. Cabot may or may not have first come ashore in North America. 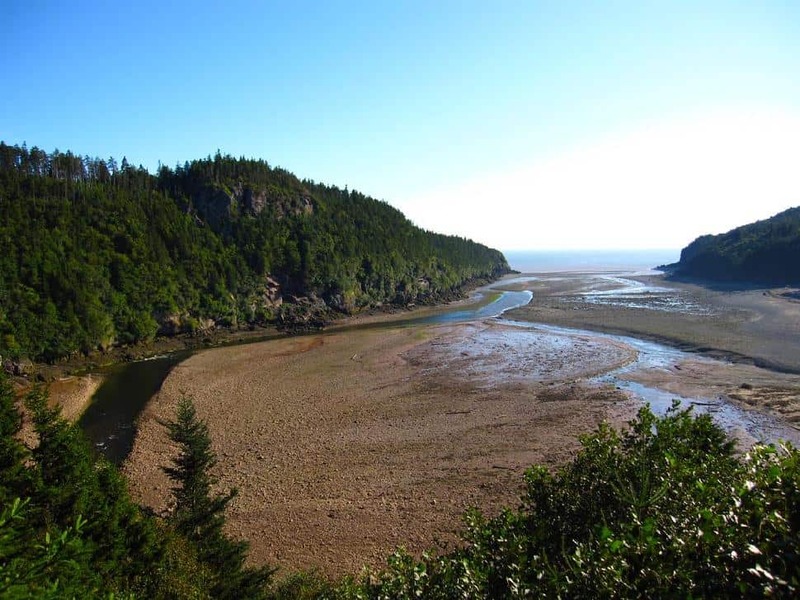 The main draw: The park may be best-known for its tides—at up to 16 metres, the world’s highest—but Fundy has much, much more to offer: Acadian forest, rolling hills, waterfalls and over 100 kilometres of hiking trails. Plus the area oozes Maritime charm—quaint villages, foggy mornings, lobster right off the boat, and whales just offshore. The Point Wolfe Campground sits at the end of the road close to the ocean, and you have to drive across a covered bridge to reach it. Things to do: Several good hiking trails head out from Point Wolfe. You can walk east to Matthews Head along the sea cliffs and headlands of the Coastal Trail. The short Coppermine Trail runs along the coast in the other direction and then loops back through the forest. For something a little more strenuous, drive east of the campground and hike the trail along Foster Brook. Or drive farther north and try Laverty Falls for a hike-and-swim combo. And of course, don’t miss the tides. If you have a boat, you can paddle from the protected waters in front of the campground out into the Bay of Fundy. Nugget: Stock up on lobster and fresh fish in the town of Alma, just outside the park. 22. Prince Edward Island National Park, P.E.I. The main draw: This small national park ain’t exactly wilderness, but it certainly has lots to do, especially this year, as it celebrates its 75th anniversary. You can keep it natural by exploring the many short trails, or you can stab your umbrella into the red sandy beach near the campground and make like a lobster all day. The warmish ocean water is a nice change in Canada. Things to do: After taking a sandcastle lesson, make the obligatory Green Gables pilgrimage. Then head over to the Greenwich Dunes Trail, a five-kilometre walk through red sands to the park’s parabolic dunes. Cyclists and rollerbladers will want to spin along the new nine-kilometre path between Cavendish and North Rustico. To celebrate its anniversary, the park is giving prizes to people who hike or bike 75 kilometres on its trails. Nugget: The park’s famous beaches protect lagoons of warm calm water, perfect for an afternoon of paddling. 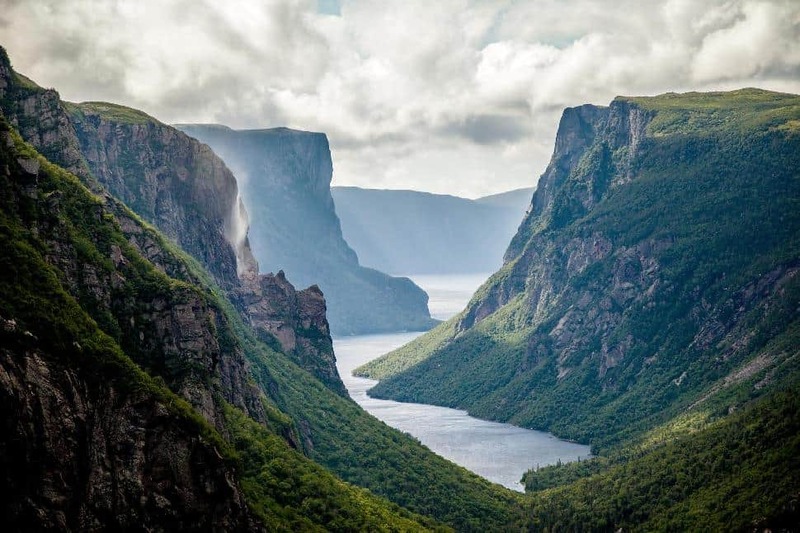 The main draw: Gros Morne is most famous for its large freshwater “ponds” and its otherworldly Tablelands area, one of the few places on the planet where Earth’s mantle is exposed. The Trout River Campground is a perfect spot to appreciate both of these features. 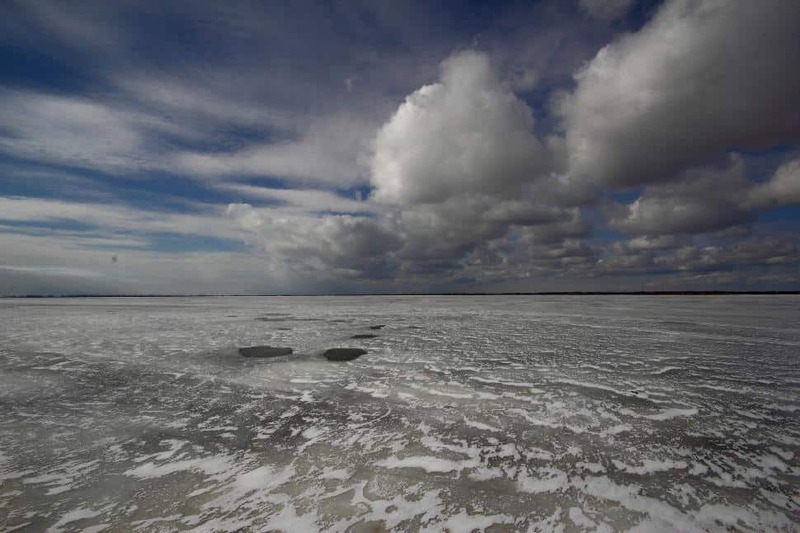 It sits close to the shore of Trout River Pond, a narrow, 15-kilometre-long lake. And from the campsites, you can see the orangey Tablelands rising above the other side of the water. Things to do: The brand new Overfalls Trail—which leads to an impressive waterfall—is located at the far end of the pond, which you can reach via a shuttle boat. Other good hikes nearby include the coastal Greens Gardens Trail and the short but steep Lookout Trail. If you like paddling, Trout River Pond is one of the best places in the park to launch a kayak. Nugget: For delicious seafood, head to the Seaside Restaurant in the nearby village of Trout River. The main draw: Located on the outskirts of Fort Smith, just north of the Alberta border, this small campground sits near the end of the Slave Rapids, a 25-kilometre section of whitewater where the Slave River tumbles onto the Canadian Shield. The rapids’ big-volume drops, waves and holes make them a playground for canoeists and kayakers of all levels. For dry-land fun, it’s a short drive to the salt flats, marshes, grasslands and karst formations protected within Wood Buffalo National Park. Things to do: Bring your boat and play in the world-class whitewater or canoe on the world’s largest freshwater delta downstream in the national park. If you prefer to stay dry, hike along the 30-kilometre riverside trail, or head for Wood Buffalo where you can explore the massive salt flats or hike the Salt River trails. Nugget: The most likely spot to see wood buffalo in the national park is along the 54-kilometre Parson’s Lake Road. The main draw: While the western half of Kluane may be locked in ice, the eastern fringe is designed for mountainous adventure. 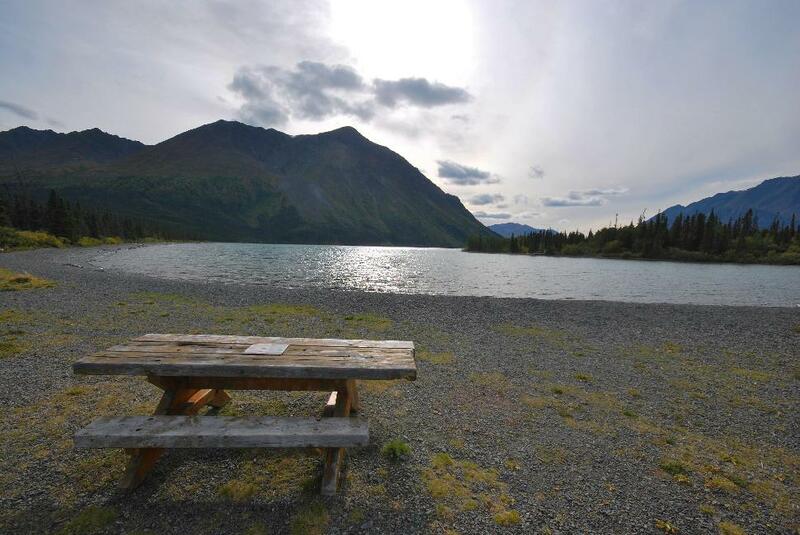 And the perfect base camp is the park’s only front-country sleeping zone—Kathleen Lake Campground. It’s surrounded by good trails, good paddling and good fishing. 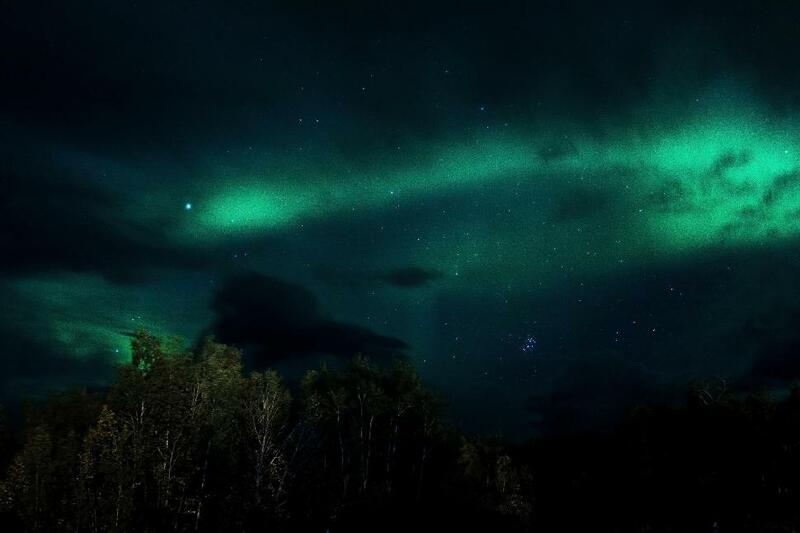 It’s also surrounded by wildlife—watch for Dall sheep, moose, wolves and, yup, grizzlies. Things to do: The King’s Throne Summit hike starts from the campground and climbs steeply to a peak high above Kathleen Lake, with excellent views of the snow-covered mountains to the west. The nearby Auriol Trail is another excellent hike. Mountain bikers can grind along the rough but scenic roads to Marsh or Alsek lakes. If you’d like a taste of whitewater adventure, sign on with a local outfitter and experience the first day of the Tatshenshini River trip. Or stick close to camp and launch a canoe on the fish-filled Kathleen Lake. Nugget: Don’t miss the experience of a lifetime—a flightseeing tour over the park’s glaciers offered in nearby Haines Junction. But Do You Have All The Gear?